The sample is still small for what this format is, but the variance is ridiculous! Just yesterday, I ended up being -$5k and thinking "ok, it's now that we are going to the -100bis", then I was +1k and I finished the day -$3.5k. I have also been spending a lot of time studying and cutting down the number of tables, which is why I'm a bit behind of the pace I'd like. 38.5K VPPs at the moment. I ended up playing the Sunday-Warmup yesterday and I was playing supertight to see if I could start the year ITM at the mtts, but I lost a big pot a bit before the bubble with QQ vs JTs (82%) allin pre-flop. I decided to read/ reread the books that I have at home. I started with "Harrington on Hold'em: Volume I: Strategic Play". It's not that I'm going to start playing like he teaches in the book, but there are a lot of concepts in general that I find to be interesting. This week I ended up not playing as much as I wanted to, cause I felt the need to study my game. For this format, there's a need to work with more information than for the previous one, since the ranges overall are more loose. As the ranges are looser and vary according to position, I had to find a better way to filter the information that I use while working and make sure that there's nothing left that I don't use. 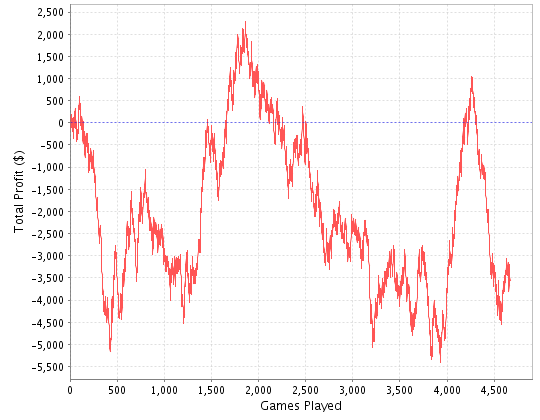 Right now, I'm losing 43.40 buy-ins at this new format. It's a bit difficult to take the lead with these downswings, and I don't know for sure if I'm a winner in this format. However, yesterday after studying I already felt better, cause I had more things I was sure about in relation to what I was doing. Something that I recommend to all my friends is: When you have a downswing, STUDY! Unfortunately, I will have to cut down a bit on the volume during the next few days, cause I haven't interiorized a big part of the ranges yet and I end up consulting my spreadsheets quite a lot while I play. As soon as the decisions become more obvious to me, I'll increase the number of tables. Even like this... when I say I cut down a bit on the volume, I'm talking about playing around 20 tables at the same time, which is not horrible at all. This Sunday I was asked to play some sitngos of PokerPt at 20:05. They are 4 sngs turbo of $11 simultaneously. Therefore, if you want to see me play the old 9-max, you can log in at PokerStars Sunday at 20:05, portuguese time! As I said some posts ago, the hard disc was slowing down my computer and was limiting the number of tables that I could play, because of the lag. As you can see from the classification of windows, now it's the disc that's ahead of everything else. However, from what I've read, I think that the 7,9 of the disc is getting lower as the disc is getting used more. I believe that it has to do with the way the ssd get the information from the disc. Tomorrow I'll try to increase the volume a bit, don't be surprised if you see me playing 35+ hyper-turbos at PokerStars! As for the rest... I have been going to the gym and I started this week with a Personal Trainer. I still think they're very expensive, but I decided to try it out to see if it's worth it or not. I decided to pay for 30 minutes sessions, basically, I do around 50 minutes of cardio by myself and then I have the PT to help me with the muscle exercises and those of flexibility. They also have the option of getting one hour sessions, but I would have to pay more and I don't think it's necessary. I don't want to be like the old ladies that are paying to have a conversation with the PT while they're doing cardio eheh.